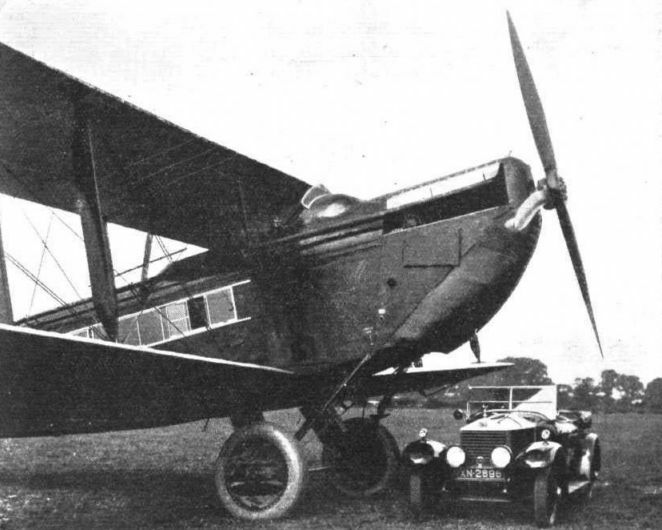 AMONG the new commercial aeroplanes planned for 1925 and now nearing completion, is the 14-passenger de Havilland 54, which is to be fitted with a single ДальшеMore>>> Rolls-Royce "Condor" engine. This machine, the construction of which is expected to be completed in about a month's time, is a typical de Havilland in its general lines, and might be described briefly, although not very accurately, as an "overgrown D.H.34." The general lay-out and many of the constructional features are the same, but a closer inspection reveals certain not inconsiderable differences. The general arrangement drawings published on the next page show the lines of the D.H.54, from which it will be seen that the machine is a normal two-bay biplane, with the top plane straight and the lower set at a considerable dihedral angle. A feature of the D.H.54 will be the provision of camber gear similar in principle to that first tried out on the type D.H.50 with such success. This gear, it may be recollected, consists in a hinged trailing edge pulled down by the action of springs and rising under increased air pressure with increase in speed. The gear is entirely automatic in action as regards the variable camber function, but the flaps are divided, the outer portions retaining their differential movement and aileron action. The advantage of this flap gear is two-fold: it reduces the stalling speed considerably, and, what is almost of as great importance for a passenger machine, it allows of approaching the aerodrome with the fuselage practically horizontal, because the effect of the camber gear is to increase the angle of incidence as well, so that with the tail down but a few degrees the wings are at the angle of maximum lift. There may be a third and less obvious advantage with the sprung flaps in coming out of a stall. Certainly, in the D.H.50, the drop is very small before the machine flattens out after a stall, and it is thought that the D.H.54 may to some extent have the same characteristics. Constructionally, the D.H.54 follows previous de Havilland practice m that the fuselage is a ply-wood-covered structure devoid of wire or tie-rod bracing. In the new machine, however, a departure from usual practice is to be found in that the fuselage is in two sections, so as to facilitate ground transport. The joint in the fuselage occurs just aft of the cabin door, and actually the two spare seats and the lavatory are in the tail portion of the fuselage. The joint is in the form of bolts through the longerons, with fish-plates inside and out. Each portion is a complete structure in itself, and the joint between the two portions is covered with a fabric strip so as to make the fuselage watertight - at any rate, the cabin portion of it and the first two bays aft of the joint, at the end of which is a watertight bulkhead. The rear portion of the fuselage is provided in each bay with large openings in the bottom, the object of which is to give access to the interior for purposes of inspecting the structure. In actual use these openings will be covered over with doped fabric. Unusual head-room characterises the main cabin of the D.H.54, in which there will be seating accommodation for 12, or possibly 14, passengers. The roof structure shows curved beams of built-up box section, and even under these beams the head-room is about 6 ft., while between the beams the distance from floor to roof is some 6 in. more. The permanent seats are arranged in three rows, two close together on one side and a single row on the other, with a narrow gangway running between. Behind the permanent seats, and against the rear wall of the cabin, is another spare seat with room for two passengers. Aft of the cabin is a large lavatory with the usual fittings. The door to the cabin is placed on the starboard side, and provision is to be made for making a watertight joint between door and door-frame, so that in case the machine should be forced to alight on the sea, it will, it is expected, keep afloat for many hours if need be. It may be recollected that experiments were carried out at Felixstowe last year with a D.H.18 in order to determine how long a land machine with its cabin made watertight would remain afloat. The D.H.54 will incorporate the experience thus gained. 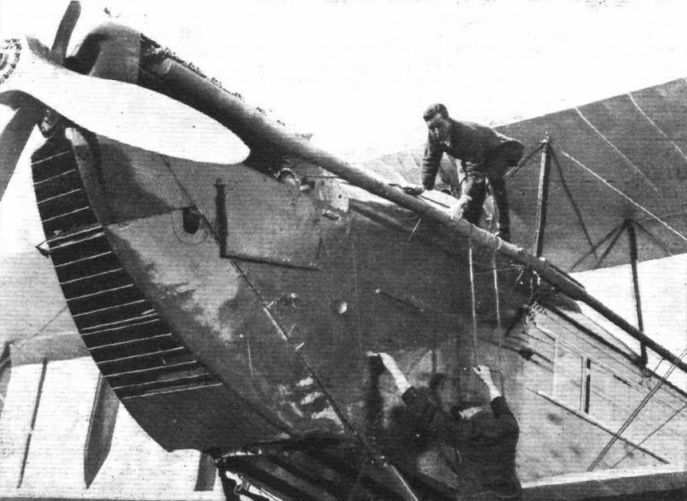 One of the difficulties of preventing an aeroplane from submerging on alighting on water is that the undercarriage usually causes the machine to nose over, so that a fair amount of water gets into the cockpits and cabin. In the D.H.54 this will be guarded against by arranging the undercarriage so that it, or at any rate part of it, can be dropped when the pilot realises that a forced descent on the water is unavoidable. This is accomplished as indicated in the accompanying sketches. The undercarriage, which is of the usual De Havilland Vee-type, except that the shock-absorbing gear is in the form of rubber blocks working in compression and incorporating oleo damping gear, has its front legs cross-braced in the usual way, but the rear bay has no such bracing. At their upper ends the rear legs are attached to the lower longerons by means of a substantial bolt, and this bolt can be withdrawn by the pilot by means of the mechanism shown in the sketch and a lever in the cockpit. When the bolt is withdrawn the undercarriage is free to drop, and in so doing the hook attachment of the axle to the front chassis struts allows the former to fall free, the front struts and their bracing remaining in place on the machine, but swinging free so that on impact with the water they will be forced back and up against the bottom of the fuselage. It is not thought that the presence of these struts will cause any appreciable tendency to nose over. The cabin of the D.H.54 is lighted by large windows in the side, and heating and ventilation has been arranged for, hot air from a muff around an exhaust pipe being admitted through a diffuser near the floor, and fresh air, forced in by a scoop placed in the roof, being admitted through another diffuser placed at head level. The amount of hot and cold air admitted can be regulated by the passengers themselves, a regulator being placed on the front wall of the cabin. Emergency exits are provided in the roof, and take the form of circular openings covered with fabric. The pilot's and navigator's cockpit is situated ahead of the top plane, between it and the engine, and as the pilot's seat is raised and the coaming around it forms a "hump," the view forward and laterally should be quite good. The Rolls-Royce "Condor” engine is mounted on a composite wood and metal structure, and the nose of the fuselage terminates in a nose radiator provided with shutters for varying the cooling. Direct gravity feed is provided, the petrol tank, which is in the form of a deep wing section, occupying the whole of the top centre section, with direct supply to the engine. It is not yet possible to give complete details of the D.H.54, but it may be stated that the total loaded weight will be in the neighbourhood of 11,000 lbs. As the wing area is 1,005 sq. ft., this will give a wing loading of very nearly 11 lbs sq. ft., which seems quite high enough. A top speed of 110 m.p.h. is expected, and a cruising speed of 100 m.p.h. On a basis of 700 b.h.p. the power loading is 15-7 lbs./h.p., and the power expenditure, for full load, will be only 50 h.p. per passenger, which is a very reasonable figure in view of the high cruising speed. We have not seen the performance curves of the machine, and so do not know what the horsepower required at cruising speed is. There seems, however, to be reason to believe that this is fairly low, as the machine is of clean lines, and it may therefore be expected that the D.H.54 will be a really commercial machine, and will bring the day closer when civil flying becomes self-supporting. ON Thursday of last week we were privileged to witness the first flying tests of the new De Havilland passenger biplane, the D.H. 54, which has now been finished as regards its main structure, although the cabin is not entirely finished internally in the matter of seats and other equipment. In the tests at Stag Lane Aerodrome the D.H.54 was piloted by Capt. Broad, who first took the machine up without passengers for a few trial flights, and later on went up again with several passengers in the cabin and one in the engineer's seat in front. The machine appeared to get off very well indeed and to have a very good climb, not only as regards rate of climb, but even more so in the way of climbing angle. Even so it should be remembered that the machine is as yet untried and that the pilot is not yet quite used to handling it, so that there is every reason to believe that later on the climb will be even better. As the flights were in the nature of preliminary flying tests, no attempt was made at obtaining other than very rough performance figures and it would scarcely be fair to the company to give these at the present time, since they may be subject to considerable alteration after properly conducted tests. There is, however, reason to believe that the new De Havilland D.H.54 will have a greater top speed than the famous '34 and a considerably lower stalling speed. This is mainly due to the fact that though the power loading is approximately the same as that of the D.H. 34, i.e., about 17 lbs. per h.p., the wing loading is a good deal less than that of the '34, while the use of the De Havilland automatic flap gear should give a considerably greater maximum unit lift. Apart from the reduction in stalling speed, another advantage of the lighter wing loading should be a considerably better angle of climb, an assumption which was indicated by the preliminary test flights to be correct. Without going into details regarding performance it may be said that the machine was designed to have a cruising speed of over 100 m.p.h. and that probably the actual cruising speed with full load will be in the neighbourhood of 103-104 m.p.h. In general design and construction the D.H.54 follows very closely standard De Havilland practice, and at first glance the '54 looks very much like the '34, but on a larger scale. There are however, several noticeable differences in general design as well as in details. One change in design is connected with the placing of the top plane in relation to the fuselage. Whereas in the '34 the top plane rests directly upon the fuselage, it is raised in the '54 a considerable distance above the top of the fuselage. This arrangement arises out of the fact that, with the larger chord of the '54 wings, a larger cap was required, and as the fuselage is of approximately the same depth as that of the '34 the raising of the top plane resulted. In general design the D.H.54 is a normal two-bay tractor biplane with straight top plane and a fairly pronounced dihedral to the lower plane. A feature which impresses one both on looking at the machine and from an examination of the accompanying general arrangement drawings, is the high aspect ratio of the wings which have a span of 68 ft. and a chord of 8 ft. giving an aspect ratio of 8-5. Constructionally also the D.H.54 follows normal De Havilland practice in that it has a flat-sided fuselage covered with ply-wood and having a deeply cambered roof. In view of its size the fuselage has been built in two separate sections. The joint in the fuselage occurs just aft of the cabin door, the joints being in the form of bolts through the longerons, with fish-plates inside and out. Each portion forms a complete structure in itself, and to keep out water in case of an emergency landing the small opening between the two sections is covered with fabric strip. To facilitate inspection of the rear portion of the fuselage large openings are provided in the bottom, which are covered with fabric so that when the machine has been in use for some time all that is necessary is to cut away a piece of the fabric when the interior structure can be inspected and after inspection the opening is again closed by doping a piece of fabric over it. The cabin portion of the fuselage is very large and roomy and seating accommodation is provided for fourteen passengers, the seats being arranged in three rows, two close together on one side and a single row on the other with a narrow gangway down between the two for the whole length of the cabin. Aft of the cabin is a large lavatory with the usual fittings, the lavatory and the last two passenger seats being actually situated in the tail section of the fuselage. Access to the cabin is by a door on the starboard side, and in the design of the door provision has been made for making a watertight joint between it and the door frame so that in case the machine should be forced to alight on the sea it will keep afloat for quite a long time. Provision has been made for heating and ventilating the cabin, the heating arrangements being in the form of a muff around one of the exhaust pipes and admitting warm air to the cabin near the floor. Fresh air is forced into the cabin from a scoop projecting out of the cabin roof, just behind the pilot's cockpit, and louvres near the back of the cabin exhaust the air so that a fresh supply of air is constantly filtering through the cabin. The rate at which the air can be changed is adjustable from within so that the passengers can alter it from time to time so as to suit any conditions obtaining at the moment. A safety measure is provided by emergency exits in the roof of the cabin, the openings normally being covered with doped fabric which, however, can easily be cut or torn off should it for any reason become necessary for the passengers to emerge from the cabin through the roof, such as might occur in a forced alighting at sea. The Rolls-Royce "Condor" engine is mounted on a composite structure of wood and steel, and is, of course, separated from the rest of the machine by a fire-proof bulkhead. The pilot's cockpit is in the roof and is further raised by being enclosed in a "hump," so that his view should be particularly good in almost all directions. Next to the pilot is another seat for a navigator or engineer, whichever is carried in the machine, and the view from this seat also is very good, although it is on a slightly lower level than the pilot's cockpit. The petrol system is of the simple gravity type, the main petrol tank being fitted in the top centre section, from which a “petroflex" tube runs to the engine. The capacity of the petrol tank is 148 gallons. The undercarriage of the D.H. 54, although of the normal V-type, incorporates certain novel features, such as the shock-absorbing gear, which is in the form of rubber blocks working in compression, a type which has been found to give excellent results in practice, and to be light and durable, and reasonably cheap. 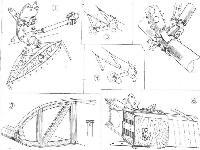 A further feature of the design is that parts of the undercarriage, i.e., the wheels, axle, and rear undercarriage struts, can be dropped should the machine be forced to come down on the sea. The front struts remain in place, but as they are free to swing loose once the rest of the undercarriage has dropped, they would presumably fly back against the bottom of the fuselage as the machine struck the water. It is expected that this arrangement will greatly reduce the tendency of the machine to nose over on striking the water, and it would therefore provide an extra safeguard. 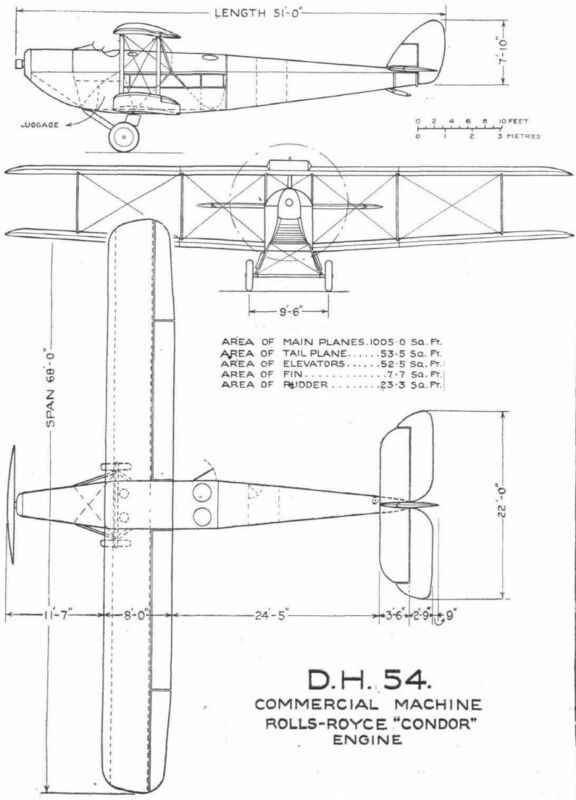 The main planes of the D.H. 54 are of normal De Havilland construction with box spars and spruce ribs. 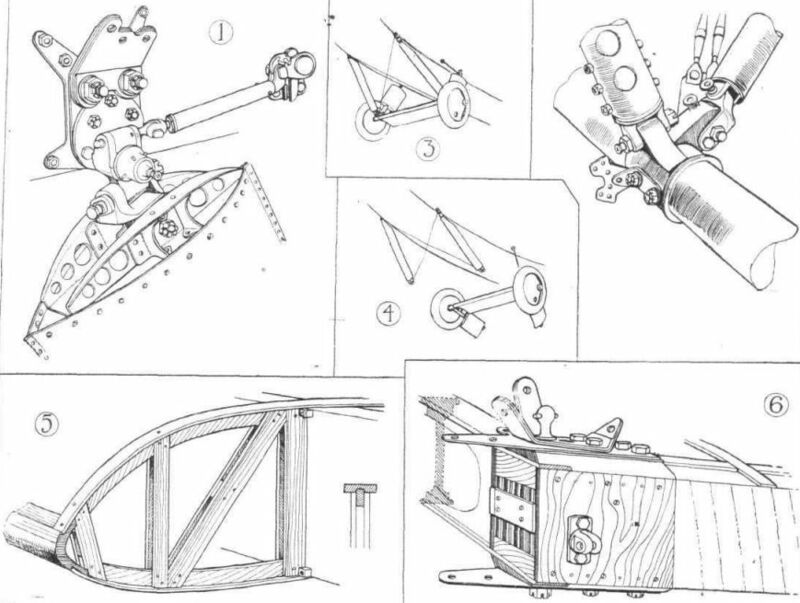 The latter are, however, of slightly different construction, the details of which are shown in one of our sketches. To facilitate transport the top wing is in three sections and the bottom wing in four sections. The wings are not, however, designed to fold. A novel feature in the wing design of the D.H. 54 is the incorporation of the new De Havilland automatic flap gear. This has previously been described in FLIGHT, but it may be stated briefly that it consists of trailing edge flaps extending the whole length of the wing span, but divided on each side. The inner portion of these trailing flaps lifts under air pressure against the action of springs, so that as the machine gathers speed the flaps rise to normal position. As the speed drops the flaps begin to descend, until at some pre-determined speed they are down to the maximum position, thus giving an increase in camber and incidence, accompanied by an increase in lift. The outer portion of the flaps, although moving with the main flaps, still maintain their differential movement and act as ailerons in the usual way. It is thought that by the use of this camber gear the landing speed of the machine will be reduced by quite a considerable amount, and the gear has the further advantage that it enables the machine to approach an aerodrome at low speed without having to drop its tail to any great extent, and in point of fact with the flaps down and the machine close to stalling angle the fuselage is still very nearly horizontal. This should add greatly to the feeling of safety among the passengers, since it is rather disconcerting to approach an aerodrome with the tail well down. As we have already said, it is not possible at the moment to give exact performance figures, but it is hoped that these will be available shortly when we expect to publish them in FLIGHT. In the meantime it may be said that the empty weight of the D.H. 54 is 7,000 lbs. and the total loaded weight 11,000 lbs. As the wing area is 1,000 sq. ft., the wing loading will be 11 lbs. per sq. foot, which is fairly high, but with the flap gear it is expected that the landing speed will only be about 55 m.p.h. The D.H.54 with Rolls-Royce "Condor" engine has seating accommodation for 14 passengers. 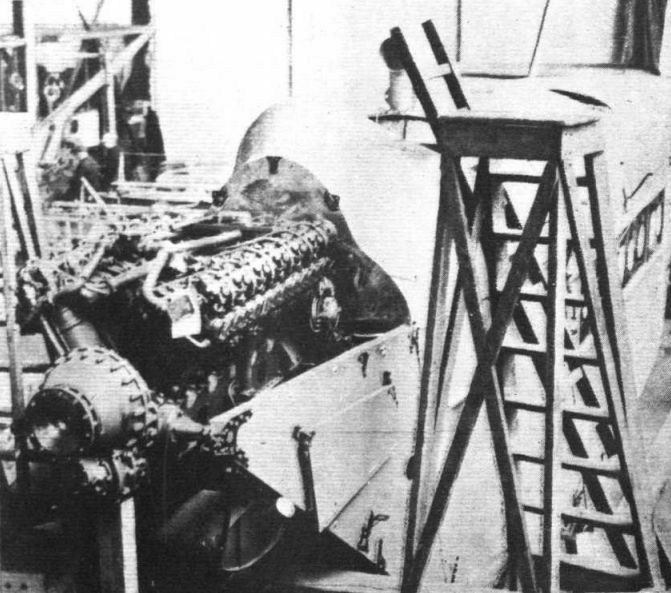 The D.H.54 is a very large single-engined machine, and in this photograph the Rolls-Royce car standing under the nose gives an excellent idea of the relative size. As Long as it is Broad: This photograph of the nose of the D.H.54, or "Highclere" as the machine has been officially named, showing Capt. Broad getting into the cockpit, gives a good idea of the size of this latest de Havilland air liner, which is fitted with a Rolls-Royce "Condor'' engine of 650 h.p. The D.H.54 Commercial Aeroplane (Rolls-Royce "Condor" Engine): The fuselage nearing completion in the Stag Lane shops. 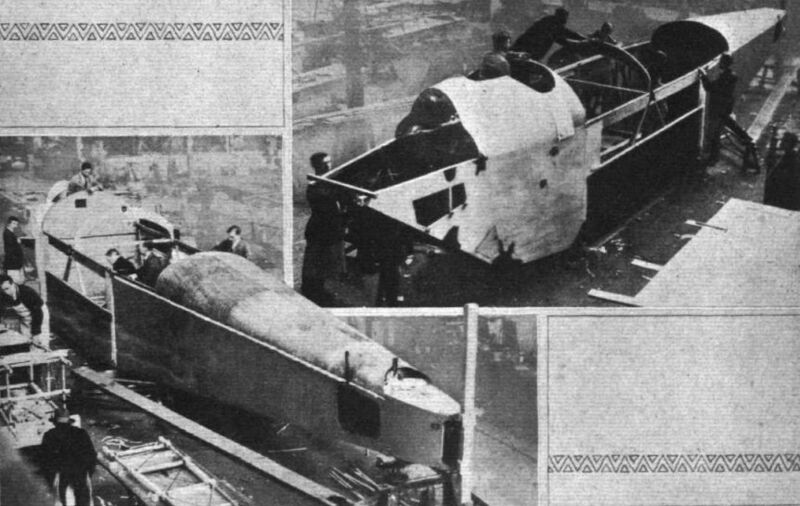 A NEW DE HAVILLAND AIR LINER: The fuselage of the D.H.54 in course of construction at the Stag Lane Works of the de Havilland Aircraft Company. The men alongside give some idea of the size of the machine, which will carry 14 passengers. The power plant is to be a Rolls-Royce "Condor." The new De Havilland Air Liner: The Rolls-Royce "Condor" has now been installed in the new D.H.54, as shown in our photograph, taken recently in the Stag Lane works. SOME CONSTRUCTIONAL DETAILS OF THE D.H.54: 1, The rear chassis strut is attached to the lower longeron by a fork-end and pin; when the pin is withdrawn, by means of the crank and rod shown, the leg is free to drop; 2 shows details of the hook attachment of axle to front chassis strut; while 3 and 4 are diagrammatic representations of the manner in which the undercarriage drops. The front struts remain on the machine, but swing free. 5 gives details of the rib construction, and 6 shows a spar root, with strut attachment and wiring lugs.